In honour of World Ranger Day, we interviewed Head Ranger, Andrew Kearney, who manages our Rangers Department at Shamwari Private Game Reserve. Being able to put back into conservation and tourism by managing, developing, mentoring and teaching guides the ethical way of doing things. It benefits tourism and conservation as a whole. I enjoy spending most of my time on foot by looking at the tracks and signs of animals. I am most passionate about using my skills to identify all that the bush has to offer. What’s your worst part of the job? Firstly, when we lose good people from this industry, and secondly, when you see animals and nature being harmed negatively through people’s behaviour, attitude and actions. Poaching, plastics and animal abuse are an ever increase concern and one of the most difficult aspects of a rangers job is that we’ve only got a few days to influence our guests to have a better viewpoint towards nature and the environment. We as rangers can only hope that we’ve made a small difference by influencing change in human behaviour and attitude toward the environment. Never stop learning, never stop studying and always follow your dreams. In this industry, rangers have to deal with people, to fight for a cause and change a view point. It requires a lot of passion, hard work, people skills but in the same breath, it is very rewarding. 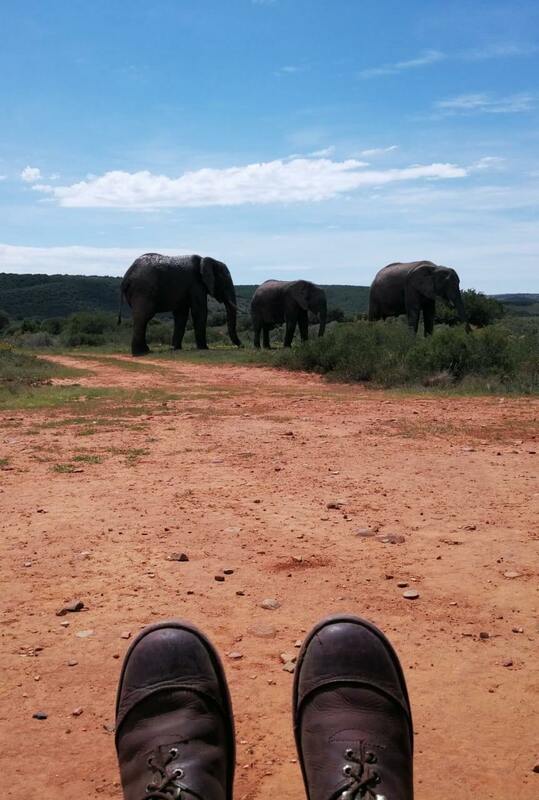 The satisfaction that you get from making peoples dreams come true by giving them a once in a lifetime experience, when they develop an emotional connection to mother nature and Shamwari, it’s a wonderfully powerful thing. There’s active protection where the rangers go out and do anti-poaching and assist with fence checks and then there’s protection through awareness and education by making people aware of the plight of wildlife species under threat which ultimately could contribute to the success of these populations. Every person needs to know and realise the impact that they themselves have on this planet. It can either be a positive or a negative impact as a result of their actions. Educating themselves about the use of animal by-products, plastics, poaching and all things that affect the environment would be a good place to start. If every person chose to make small changes to the way they lived, i.e. by refraining from using all single use plastic such as straws, we can make a big difference. By educating themselves and those around them about the plight of certain species of animals, they will be making a difference on a much larger scale. It starts with you.